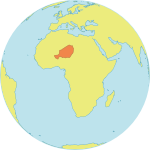 DIFFA, Niger/UNITED NATIONS, New York – Tens of thousands of people have been forced to flee south-eastern Niger following an attack by Boko Haram militants in early June. UNFPA estimates some 3,000 pregnant girls and women are among the displaced, putting them in urgent need of antenatal, maternal and post-partum care. Assaults on the town of Bosso from 3 to 5 June led to the mass movement of an estimated 75,000 people, including virtually the entire populations of Bosso and the nearby towns of Toumour and Yebi. "Several women gave birth in the bush during this mass movement,” reported Ms. Beyram, a Red Cross volunteer who is helping to deliver UNFPA supplies in the affected area. Violence in the Bosso area has been rising in recent weeks, contributing to the estimated 240,000 people displaced in Diffa Region, according to the UN Refugee Agency (UNHCR). “Before the latest attack on Bosso, one in every three inhabitants of the Diffa Region was forcibly displaced,” the agency said in a recent report. Humanitarian operations have been hamstrung by the volatile security situation. Still, UNFPA is working with partners to deliver sexual and reproductive health supplies and care to affected populations. Kits containing equipment required for safe child delivery – including obstetric supplies for emergency Caesarean section deliveries – have been distributed. Blood transfusion kits, HIV treatment supplies, treatment for potential HIV exposure, and kits for treating survivors of sexual assault have also been deployed. With these supplies, “we can identify all women victims of this situation and ensure their proper care,” said Dr. Arba Nouhou, the public health director for Diffa Region. UNFPA has also distributed hundreds of dignity kits, which contain hygiene supplies such as sanitary napkins, soap and clothes. UNFPA is working closely with the Red Cross to deliver these materials to pregnant women, breastfeeding mothers and adolescent girls. Psychosocial assistance has also been provided, and awareness sessions have been held to explain the services available. Because gender-based violence is known to increase during crisis situations, messages were disseminated about women’s right to freedom from violence, as well as care available for survivors of assault. Mobile clinics have also been deployed in refugee camps and displacement sites.